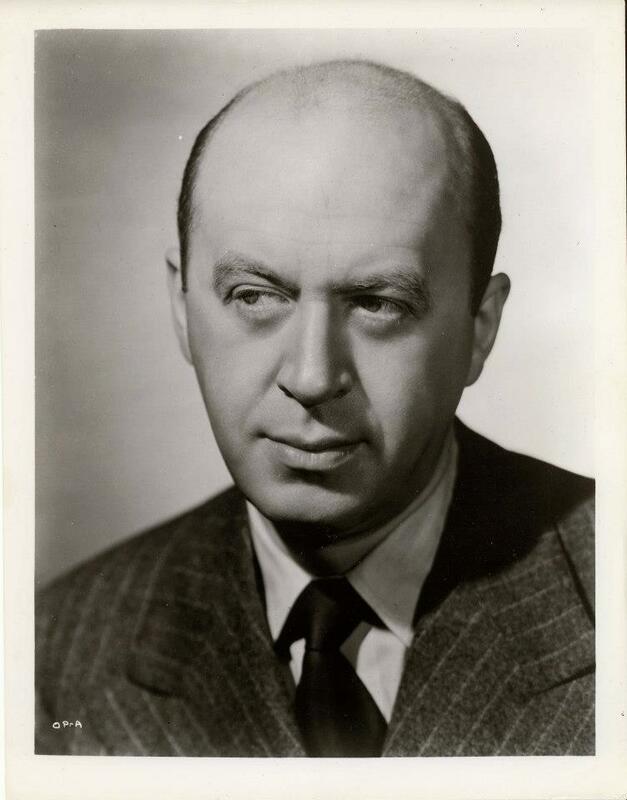 Theater had been a major part of Preminger’s life since he was sixteen, as well as a favorite source of inspiration throughout his whole career. 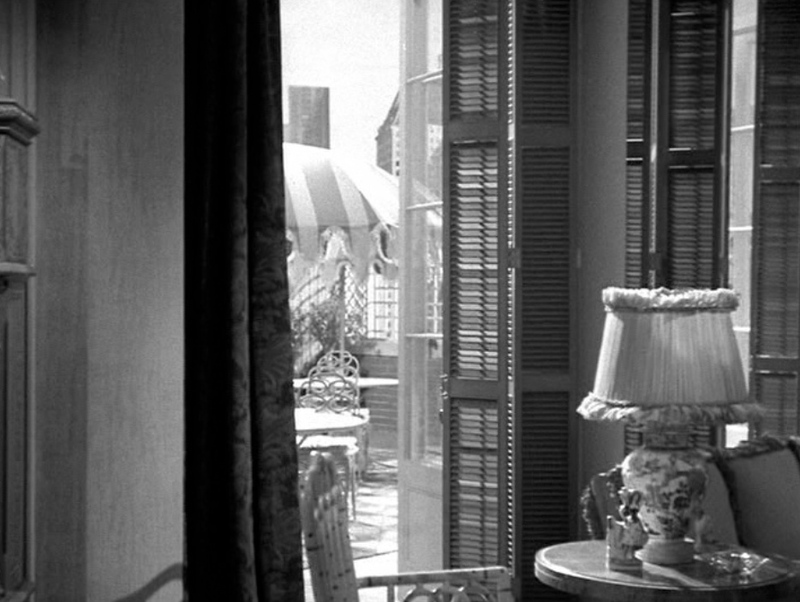 Although among the least “theatrical” of film directors, Preminger has often set up the first scenes of his films as dynamic “tableaux”, using the latters to unveil the narrative issues at stake, and to also put the protagonist squarely “at home” in a subtly evolving milieu. 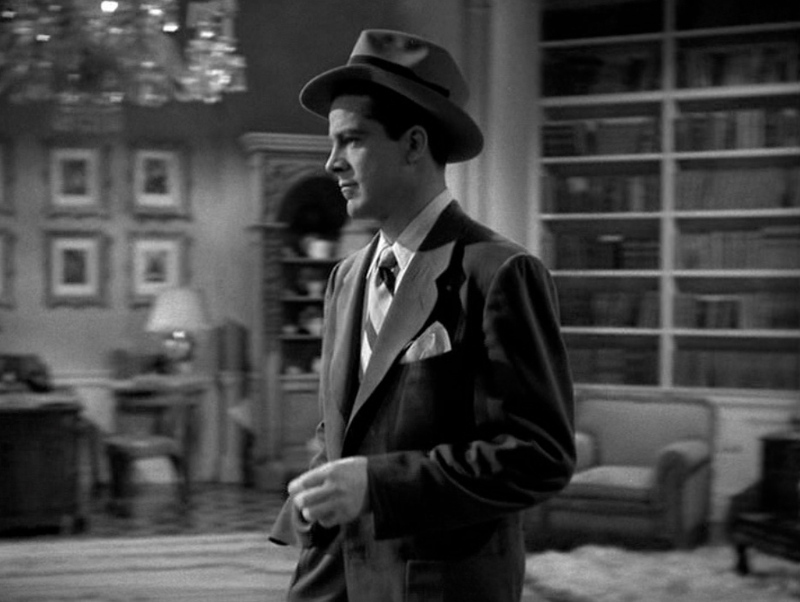 Sometimes he even planted maliciously several hidden clues in these first scenes, clues that would assume their full meaning at the end – as in the case of LAURA. What could be less “cinematic” than a black screen? And yet, since the early 40s, many films (REBECCA, LAURA, I WALKED WITH A ZOMBIE, etc) open in total darkness or in mysteriously foggy atmospheres, combining pensive “out-of-this-world” voices and music in order to catch our immediate attention, and to immerse us in a world of dreamy recollections and anguished questionings. The protagonist, still invisible and faceless, is all the more impatiently expected to materialize in a grand manner. But in the meantime his “ghostly” voice fully invades our conscience, making us totally receptive to his feelings, words and interrogations. His musical, hypnotic timbre induces a strong emotional rapport, making of us his willing captives. 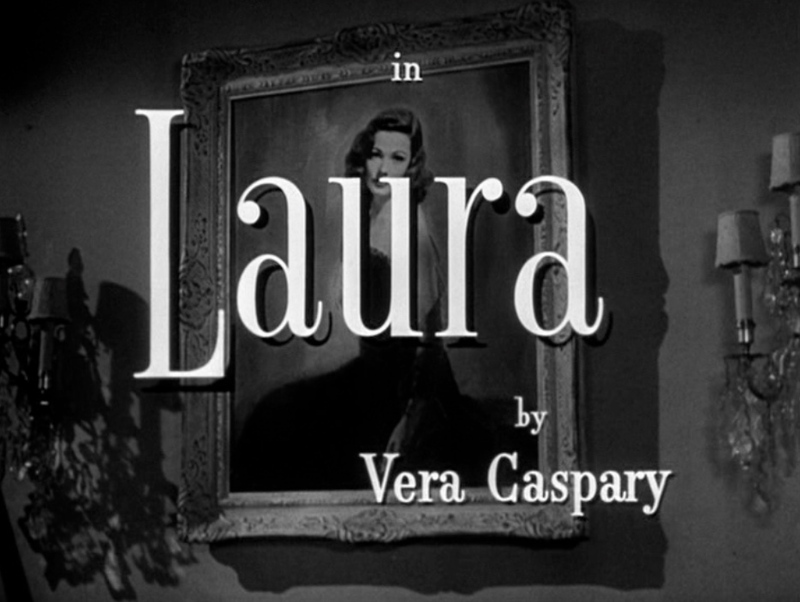 LAURA’s credits unfold over the film’s key “prop” : the portrait of the “deceased”, a vibrant post-romantic homage magnified by David Raksin’s spellbinding musical theme, soon to be a standard. This graceful but slightly stilted representation of Laura will have to satisfy us, until the time we meet the heroine “in the flesh”. 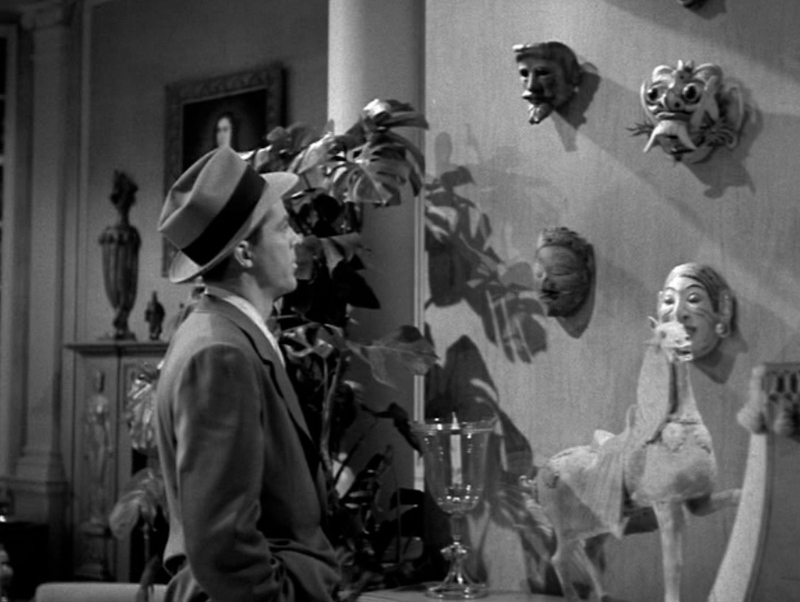 Later in the film, Waldo will inform us that the painter (Jacoby) was in love with Laura but unable to catch her radiance. Nonetheless, the model’s considerable natural charm works, putting us, viewers, in the right mood to savour the evanescent presence/absence of hers. What might such a voice have conveyed to an audience that hadn’t yet seen or heard Clifton Webb on screen? Let us try to dissociate if from the ascetic physique of Webb, so ideally suited to Waldo’s appearance. Let us try to react to those words, as if they were – and were – pronounced by an abstract entity; a ghostly figure reaching us through the night. This light, supremely elegant timbre clearly belongs to a cultivated, refined man – one who cherishes words, picks them with unerring taste and precision to convey or mask his thoughts and feelings, to impress and dominate. 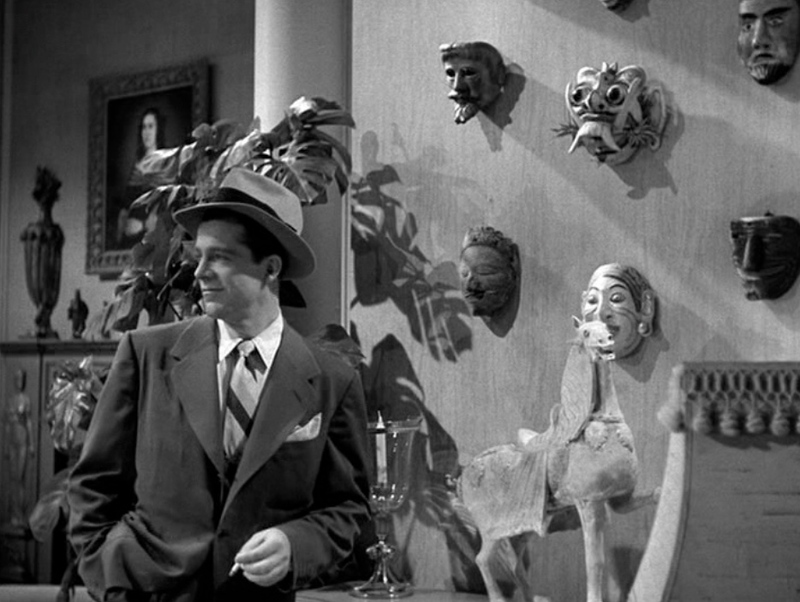 Words are Waldo Lydecker’s favorite “weapon of distinction”. They strike, scratch, cruelly bite, literally leaving others speechless. This master of soliloquy would never bother to exchange ideas, he just wants listeners to appreciate his acid “bon mots”. He will be the one to have the last word – that is, until Laura turns her back on him. His ultimate declaration of love, at death’s door, will come too late. Fade-in shows portion of half-lit salon, Waldo’s NYC apartment. Sunday, early morning, already hot. 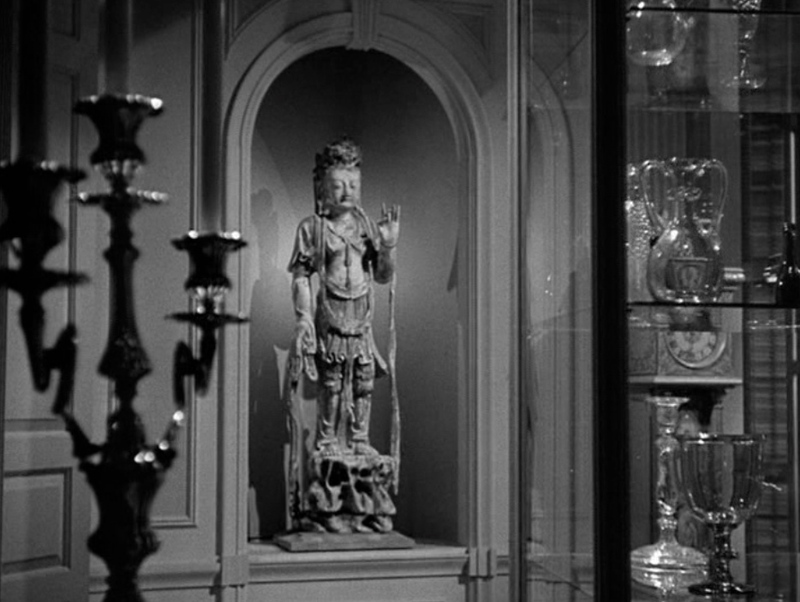 Shot opens with a close-up of an oriental statuette. Camera slowly tracks from left to right. Camera shows the back of a big transparent display cabinet. 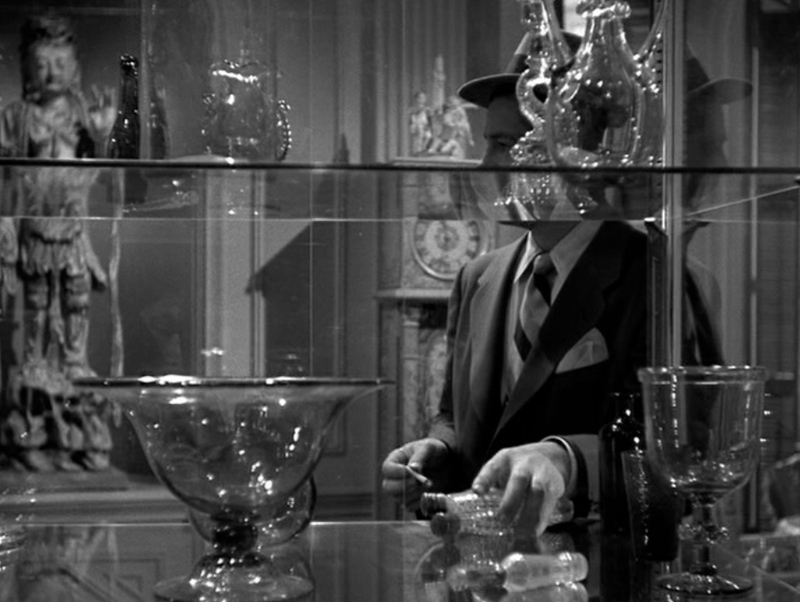 An impressive collection of glasses, crystal, a precious flask, etc. 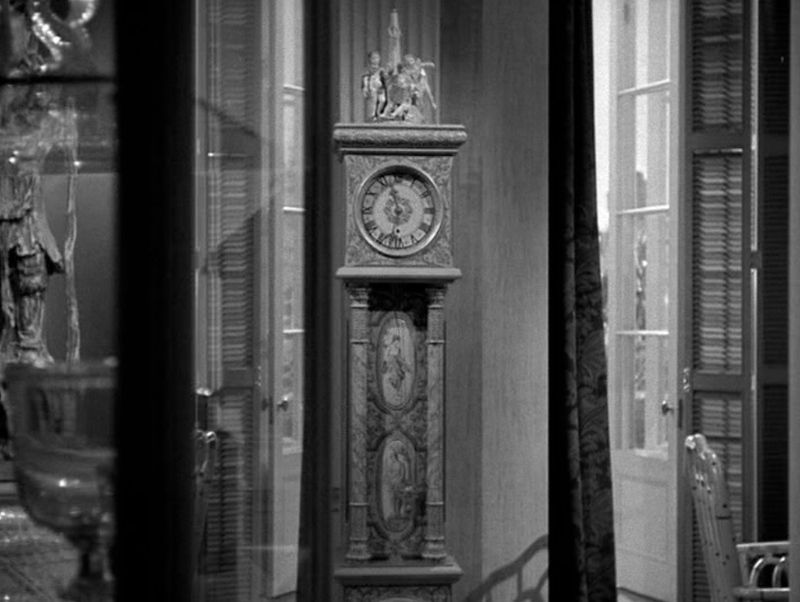 Traveling continues slowly, revealing a rare model of a “grandfather clock” (visual CLUE given here: a comment will quickly indicate that Laura has the SAME clock at her place.) Waldo comments on his loneliness in the deserted New York, and the poignant feeling of loss since “Laura’s horrible death”). 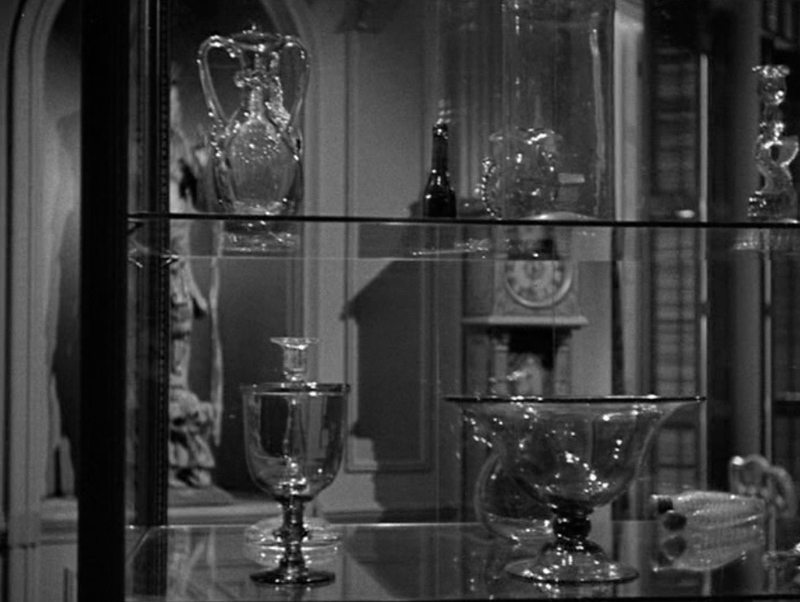 Camera now pans to the right, showing other French windows of that luxurious salon, all half-closed, as well as its furniture: a large sofa, a crystal chandelier, etc. Despite his affected nonchalance, McPherson is intrigued by this singular environment. Until now he was more familiar with lower class crimes. His presence seems a little odd in that elegant, “lavish” home of a refined egotist, collector and lover of inanimate beauty. McPherson’s presence reminds us that there is a rough, “vulgar” world beyond that luxurious, protective setting. One thing is clear, Waldo hates being intruded upon: “I had him wait”, says he, clearly piqued. McPherson smirks, probably thinking it’s just one Waldo’s fads. 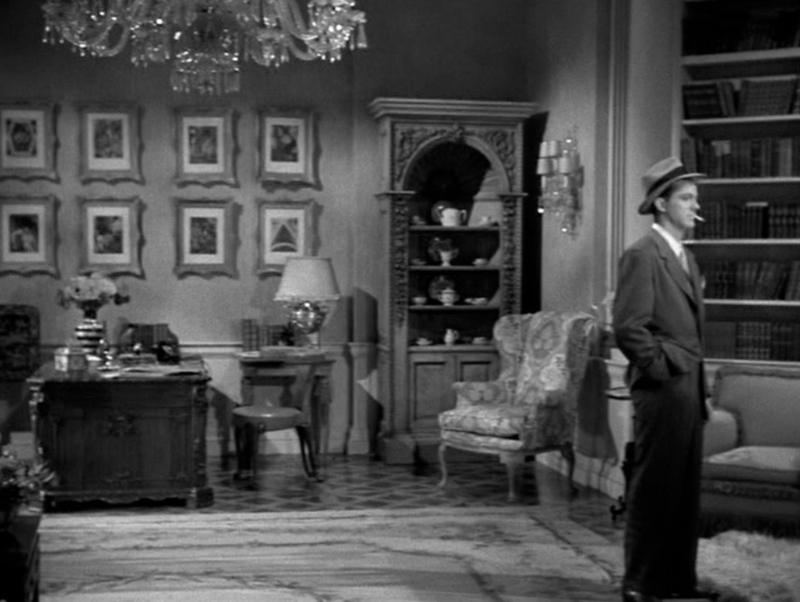 Since the start of this long take, the camera moved continuously from LEFT TO RIGHT. This sudden INVERSION signals that McPherson is now emerging as an active “movement initiator”. Space “folds back” around new axis, thus making McPherson the center of attention until the end of the take: the space that had been Waldo’s exclusive domain now seems to “belong” to McPherson. 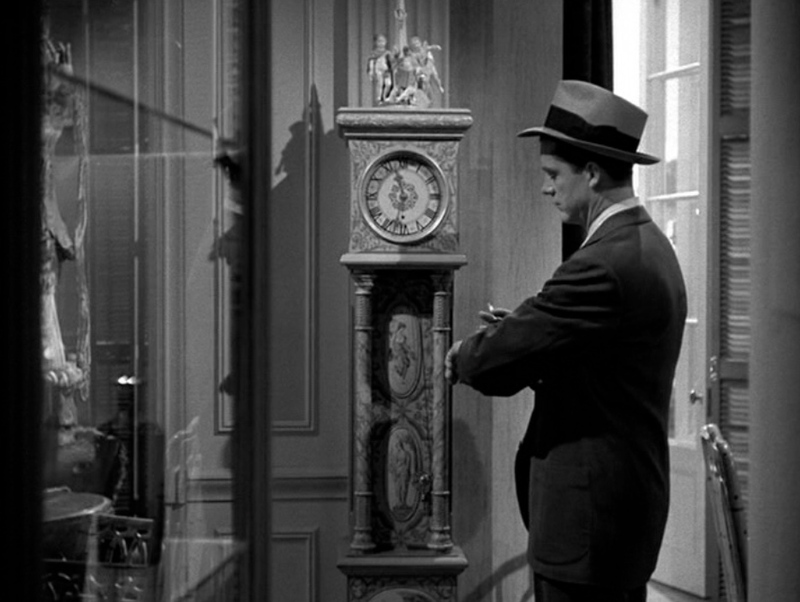 This entry was posted in Mise en scène, Narration, Uncategorized and tagged Décor, LAURA (film), Mark McPherson, Mise en scène, Narration, Otto Preminger, Waldo Lydecker. Was there any special significance to the flask McPherson was handling? 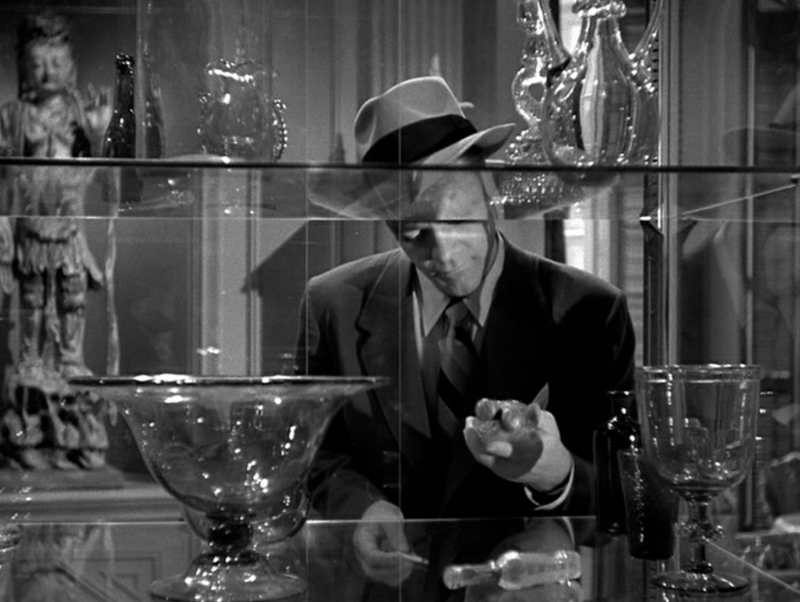 I have no idea, except for the fact that all the glass and cristal displayed in this cabinet are precious and fragile – which is probably how Waldo sees Laura. 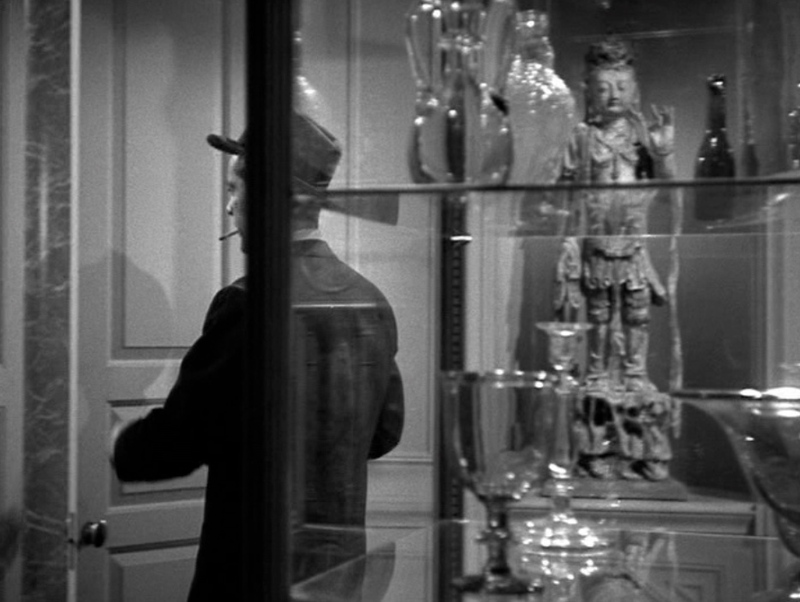 The way McPherson abruptly grabs the flask reveals him as the potential “thief” who’s going to steal Waldo’s most precious “possession”. Thank you for answering. Your “fragile & thievery” explanation makes sense, but I’d bet there was some deeper reason that item was chosen for McPherson to handle. It looked like it had two caps…like a double flask. 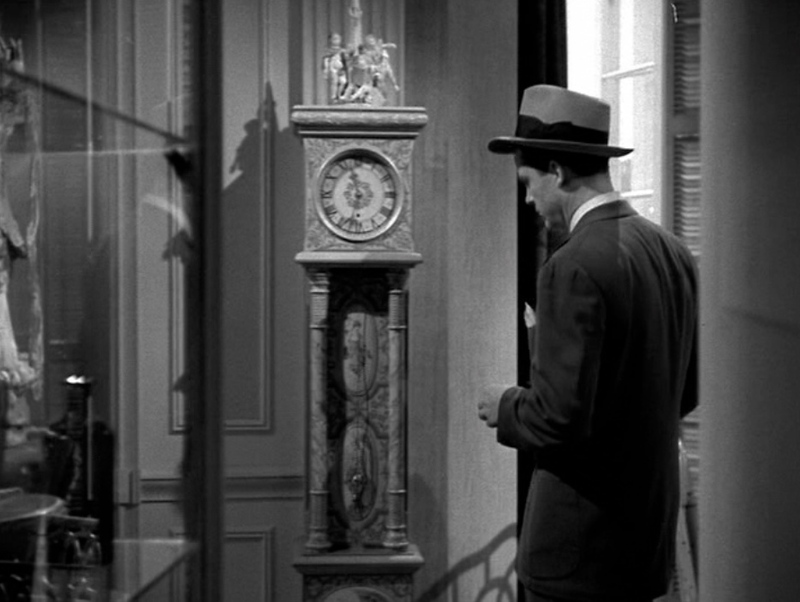 The more films I watch, the more I realize that many “insignificant details” are actually carefully planned. I think there is some meaning attached to the flask but it’s probably lost to time. I wish I had something concrete. It’s really just a feeling that it must have meaning. This is not the original begining of the movie. 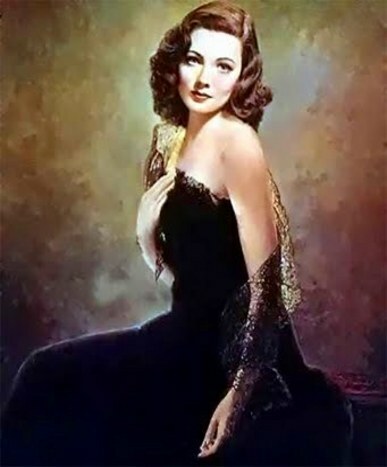 I saw the movie”laura” when I was around 12 yrs old. I was home sick from school. My mom set up our portable tv on a stand and said watch this movie…you will really like it. 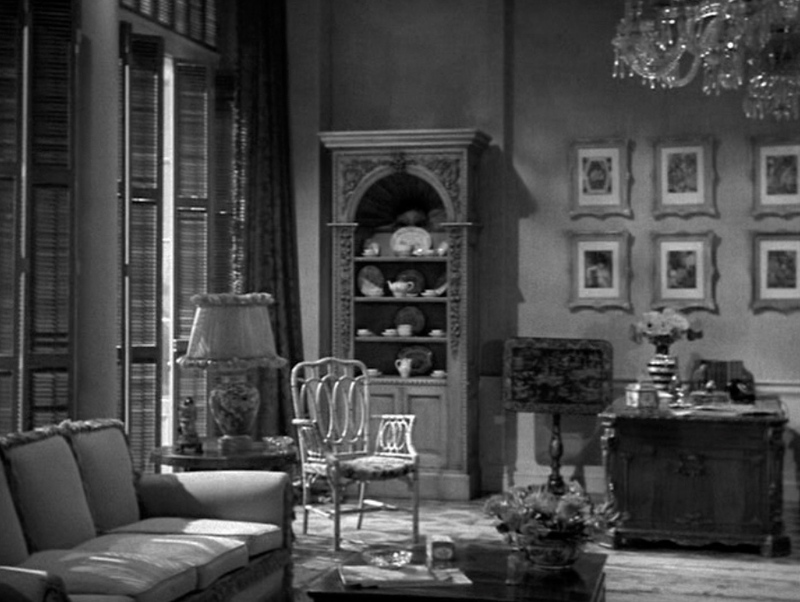 In the beginning of the movie the camara slowly moves across a moonlit room. You could hear low voices (a man and a womans), and tinkling ice in glasses. The door bell rings and all gets quiet. There is some movement then you see from the knees on down a women walking across the floor in mules(night slippers) and silk bathrobe. She answers the door on the second ring. There is a darkened figure standing in the door way and he shoots her. She falls to, the floor and then Waldo starts ‘I shall never forget…..’ My mom was correct…I loved this movie. I came to this page because I was interested in the importance of Dowson’s poem in the story. 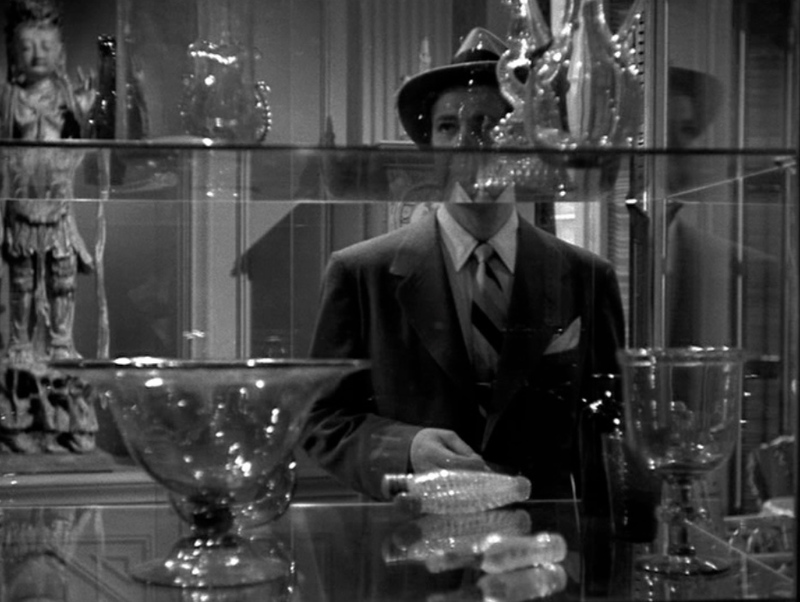 I have watched the film several times and have always felt that Waldo regarded Laura as a precious possession. His interest in her was at odds with his exhibitionism in the opening exchange with Mark. Dowson’s refined decadence was appropriate.